"Insanity is doing the same thing over and over and expecting a different result. If that old adage is true, then I am most definitely sane. Because I am once again joining my fellow NOIR CITY denizens at the Castro Theatre in San Francisco and I expect to have the same amount of fun I've had the eleven prior times I've attended the greatest film festival in this and seven other scientifically approved universes." NOIR CITY 17 #5: Kiss Kiss Kiss, Bang Bang BANG! 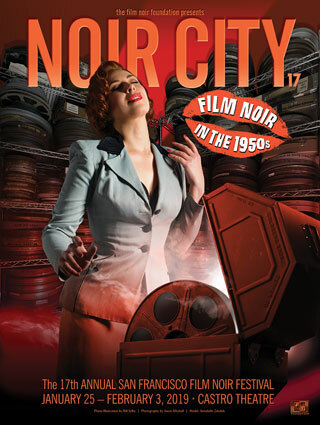 → View our complete list of films screened at NOIR CITY 1-16 here. Neither the brutally inclement weather, nor the traffic-stopping logistics of having Gus van Sant and (NC4 special guest) Sean P enn shooting a film right outside the theater could deter record crowds from packing the Castro Theatre during the 10-day festival spanning January 25 – February 3, 2008. Go here to read about the highlights of the NOIR CITY 6 including press links and photos..
Held January 26 through February 4, 2007, NOIR CITY 5 saw more than 11,000 people attending the ten-day series at the Castro Theatre, establishing a new box office milestone for the festival. 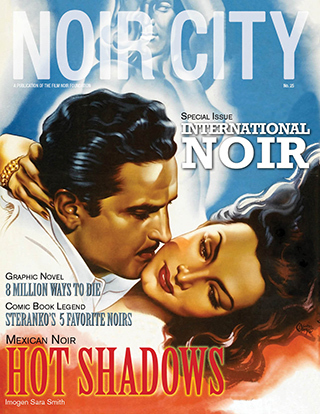 Go here to view NOIR CITY 5 photo and media coverage. Surround yourself in a miasma of social media darkness: join us on Facebook, Tumblr and Twitter for a complete immersion in the world of film noir through film stills, posters, film clips, brilliant insights, and more.